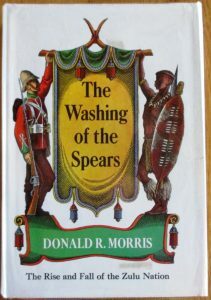 Harris led a party into the Southern African interior in September 1836. His prime purpose was to hunt, and this he most certainly did. 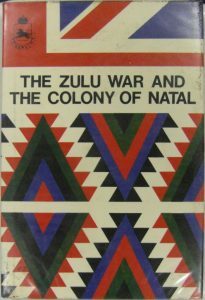 Harris was an accomplished writer and the first really competent wildlife artist to appear on the Southern African scene. 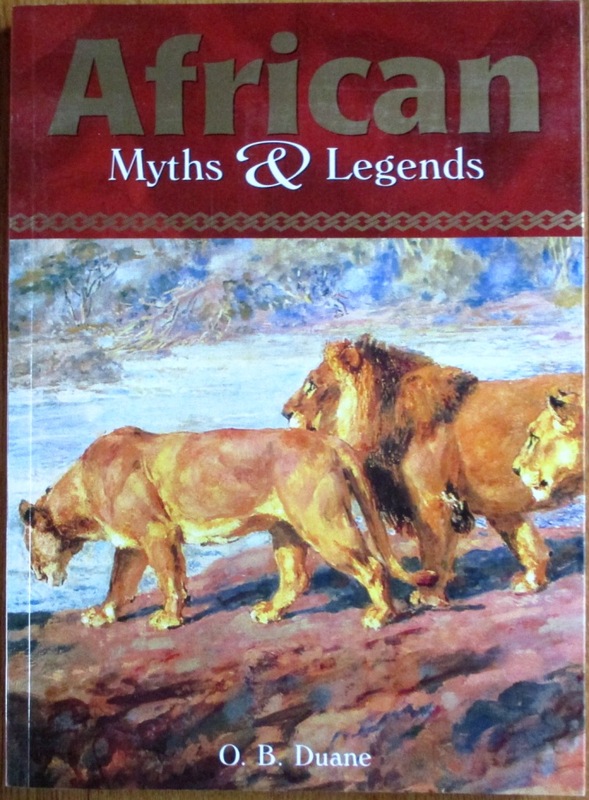 At that time North Africa had been well known to the civilised West since Roman times and before, but South of the great desert, other than settlements on the East and West coasts, it was truly the dark continent, vast, mysterious and unknown. 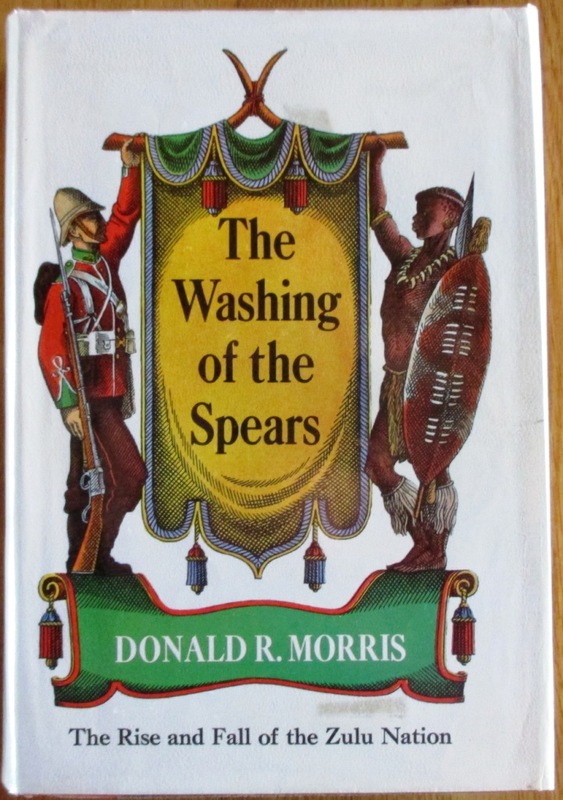 Hunters, mostly Boers, but some Englishmen as well, had undoubtedly penetrated far North into the interior, but either because they could not or were just not interested, few had left written records of their travels and even fewer had left artistic records. Stories of the wildlife paradise that the plains of Southern Africa were, had filtered through to the outside world, but there were minimal specimens to be found in the natural history museums and even less live ones in the zoos to confirm the existence of these many wondrous species. A frenchman, M.Le Vaillant, had towards the end of the 18th Century included sketches of the giraffe in his guide, but he was derided in Europe as a charlatan. Capt William (later Sir William) Cornwallis Harris, an Indian Army officer, led a party into the interior in September 1836. His prime purpose, as can be read in the pages of this guide, was to hunt, and this he most certainly did. 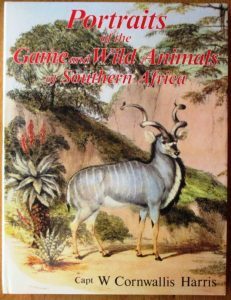 His actions in killing during the chase a vast number and a great variety of animals, would, in this a different age, be frowned on – but times were not the same then and no one would have believed most species of African game animals would one day face extinction. 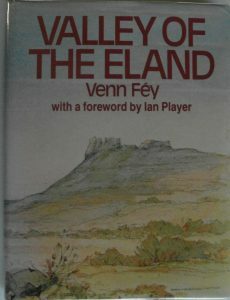 One inch tear at foot of front cover close to fore-edge, otherwise VG, now in loose protective plastic overwrap. Grey illustrated eps. 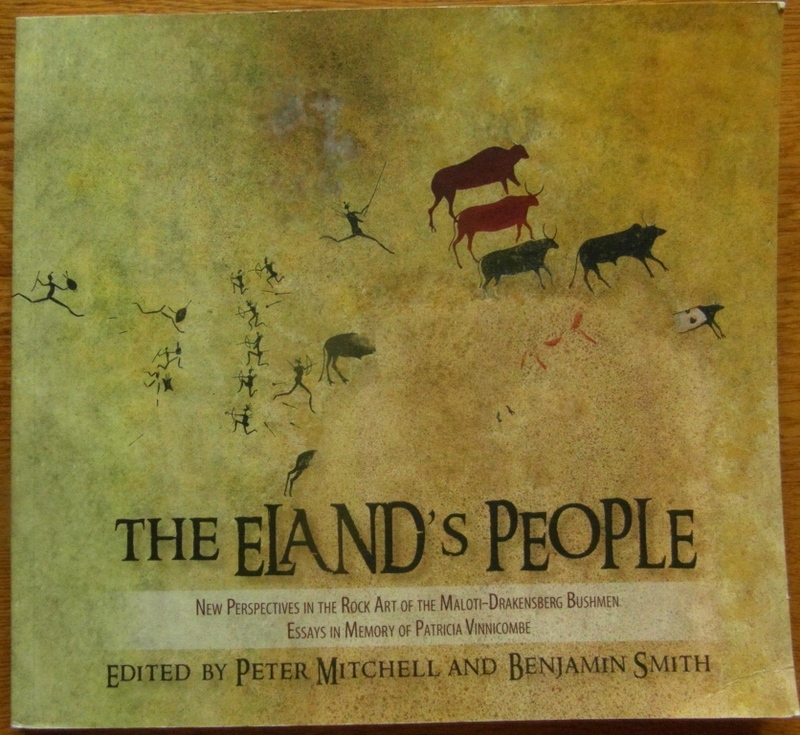 143pp of text and reproduced artwork. First published by the author in 1840. Limited edition of 1000 copies: 25 full leather; 125 half leather and 850 cloth. DJ spine is sunned. Two thin strips of library tape remnants on each foldover flap; now in loose protective plastic overwrap. Owner’s name neatly to fep.Top paperblock edge is red tone. 275 pages with sixtytwo plates. DJ is clipped, now in loose protective plastic overwrap. Colour illustrated map to ends with light spotting. 655pp of text with some photographic plates, internally clean and tightly bound. DJ is not clipped; Dewey number to spine. Ticket pocket to f/pdwn. Dewey label and library stamps to half-title page. DJ in plastic overwrap affixed at b/pdwn. Other than the library defects this is an excellent copy. 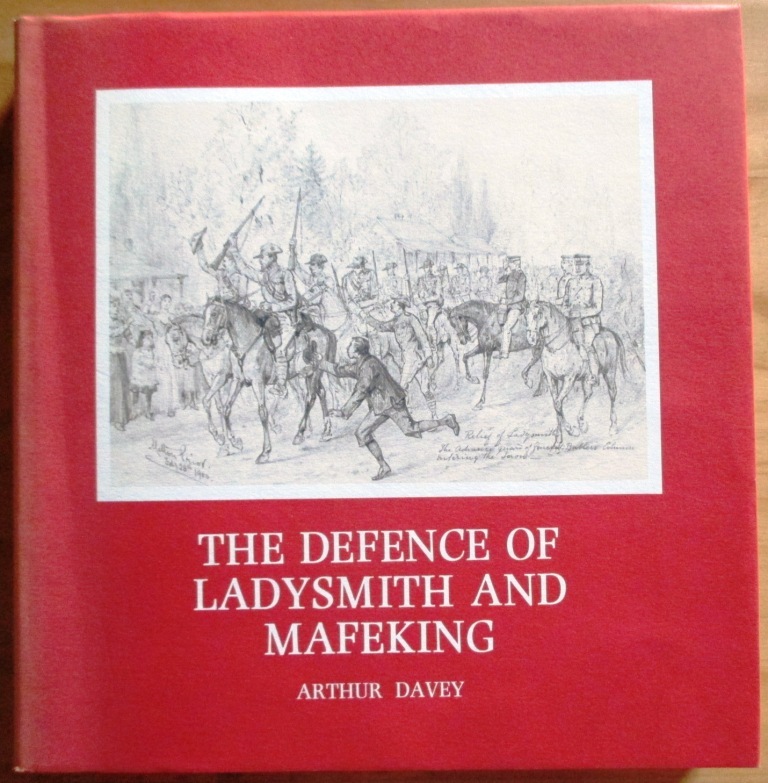 188 pages with illustrative plates. Internally clean and tightly bound. 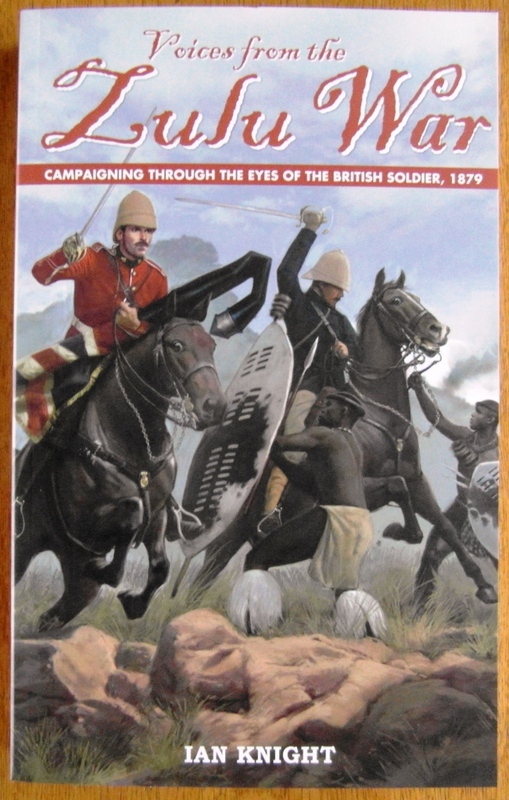 The Zulu war of 1879 was an event which had a profound effect on the history of Natal and indeed on the whole of South Africa. The lives of thousands of people, both black and white, have been influenced by it. 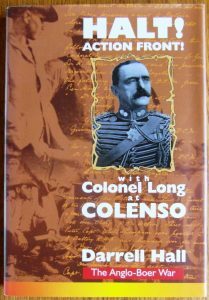 Consequently the 1979 centenary, which this book commemorates, has attracted world-wide attention. this book does not recapitulate the actual events of the war, but this publication commemorates the importance of the war in the lives of the people at the time. 272 pp, including index and with 17 illustrations. This book presents eyewitness accounts and recollections by Britiah participants in the conflict. 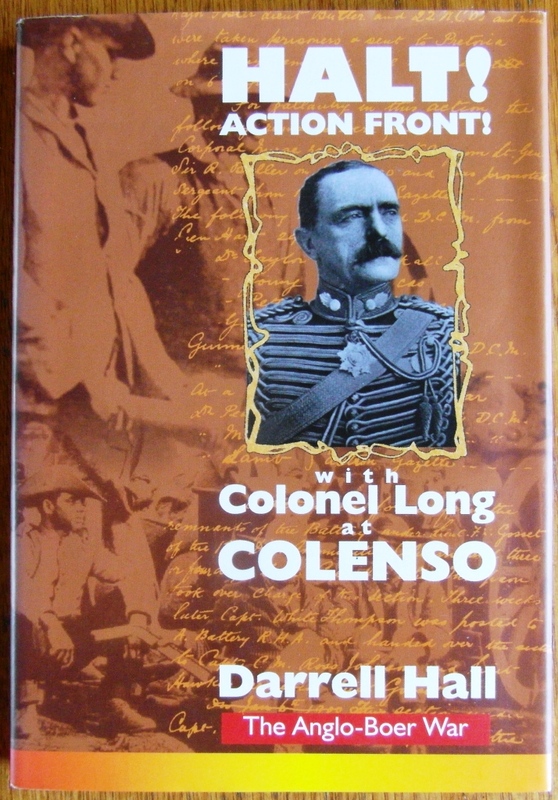 Many officers who fought in the war wrote memoirs later in their careers and these books have long been sought after as first-hand source material. 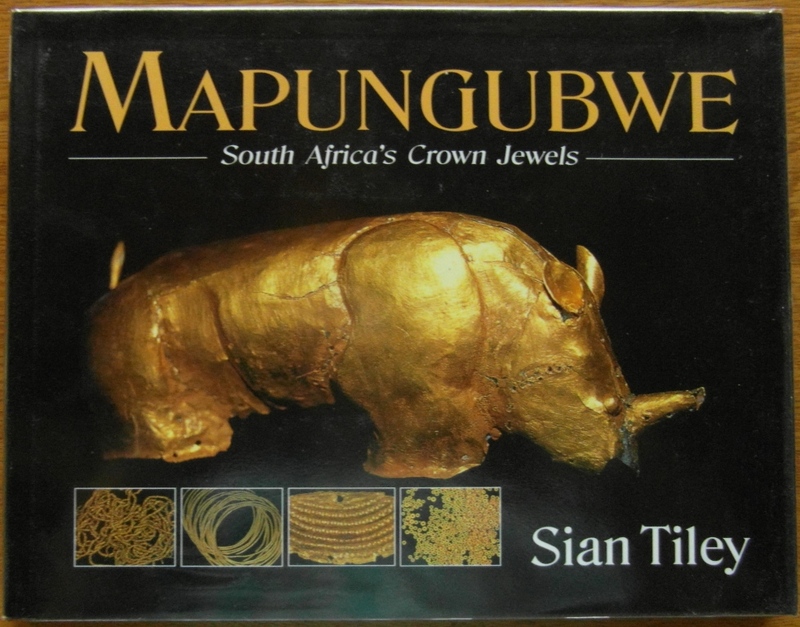 They are of vital importance to the understanding of this fascinating conflict. 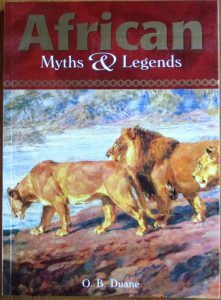 An enchanting collection of myths and tales, including a comprehensive introduction to the world of African mythology. 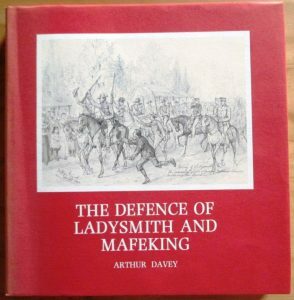 Lavishly illustrated with paintings and etchings. 128pp including index. The tales are broken into chapters: MYTHS OF CREATION, DEATH and the AFTERLIFE; ANIMAL FABLES; WIT and WISDOM. Very feint offset line at eps. 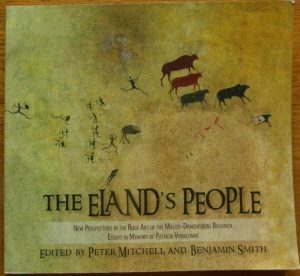 80pp of superb colour illustrations with some text. DJ now in loose protective plastic overwrap. Owner’s name neatly to fep. Some tape burn to ends, barely noticeable to fep and small 1cm square patch to rear pastedown. Bottom board edges shelf rubbed. Map illustrated ends. Pages xxiii + 183 text with line drawings. 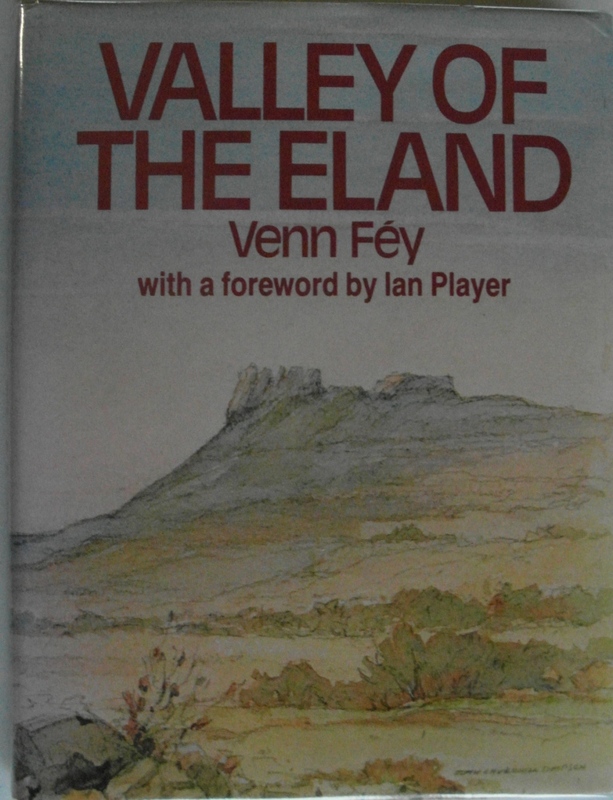 Valley of the Eland is the story of the transience of humans, individually and collectively and the impermanence of their works, set in the majestic, overpowering and yet incomparably beautiful Drakensberg Mountains of South Africa. A foreword by Ian Player. DJ is rubbed now in loose plastic protective overwrap. Board edges show some nibbled spots. Unpaginated with text and illustrations, some in colour.